Last Kickstopper was an opportunity to look at how White Wolf grew up, sold out, broke free in the form of Onyx Path, and made Kickstarter a significant component of their business plan, through the lens of the rise, fall, and resurrection of the Classic World of Darkness line, as well as examining how Kickstarter specifically plays an important role in the Classic revival. This time around, the Kickstarter in question gives us a chance to look at the New World of Darkness line and how it’s developed from its inception to the present day. This is a story with a number of curious twists and turns, many of them arising from the unusual situation Onyx Path found itself in. The publication of the core rulebook for the new line came shortly before the acquisition of White Wolf by CCP, makers of EVE Online, whose intention was to make a World of Darkness MMO (confusingly enough based on the Classic World of Darkness setting, though arguably its tendency towards big worldwide power blocs of supernaturals actually made the Classic line more suitable for MMO purposes than the New World of Darkness‘s tendency towards more localised power factions). For as long as White Wolf existed as a tabletop game producing team after that, their projects were greenlit with an eye to minimising potential disruption or consumer confusion affecting the MMO; for the early part of Onyx Path’s existence, a similar situation has pertained with respect to their World of Darkness products. Now that the MMO has died an ignoble death, CCP gives Onyx Path much more of a free hand in what they do and don’t publish; as we shall see, whilst CCP were still telling themselves that the MMO was a possibility, they forced White Wolf/Onyx Path into a number of contortions which has ironically made the New World of Darkness line a more confusing and less approachable prospect than the old line. I’ll go into more detail about that along the way. For the moment, I’ll give you a quick rundown of the consequences this confusion has had for White Wolf/Onyx Path’s game lines. Presently, if you want to play the latest version of a Classic World of Darkness game line, you just have to buy the relevant book – Vampire: the Masquerade, Wraith: the Oblivion, or whatever – and set to it. With the New World of Darkness, if you want to play the latest version of the rules you might need to just buy the latest core rulebook on its own (as is the case with Vampire: the Requiem 2nd Edition), or you might need to get the core rulebook for a game line plus the overarching World of Darkness core book (as is the case with Demon: the Fallen), or you might need to get the core book for the particular game line, plus the overarching World of Darkness book, plus a special rules update, as is presently the case with Dan’s bete noire Changeling: the Lost. Onyx Path are currently in the process of minimising the extent of this nonsense, but it’s still something of an irritation. Onyx Path and White Wolf before them have produced Translation Guides to allow people to convert characters and concepts between their various World of Darkness games and their Chronicles of Darkness equivalents – for example, if you want to use Vampire: the Masquerade setting ideas with the (generally superior) Vampire: the Requiem system, or blend ideas between the two, there’s a Vampire Translation Guide for you. Generally, I haven’t found them especially attractive; I feel like if I wanted to play or run some classic Masquerade, I’d be inclined to do it system warts and all, the effort required to convert everything not quite being worth the mild improvements made across the board. 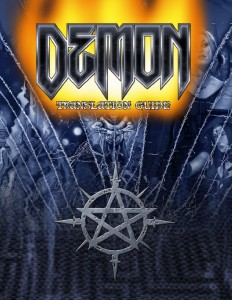 The Demon Translation Guide, though… that’s a different matter. Allowing for conversion between Demon: the Fallen and Demon: the Descent, it’s an absolute godsend, because the original Fallen system was horribly broken – and whilst its supplement line did a hero’s job of trying to fix it, it’s still worth the effort to convert to the Chronicles system. In particular, there’s finally a system for determining whether your powers go off in their high-Torment versions by accident instead of the low-Torment versions: that happens if you end up getting less successes than your Torment score on the roll, but if you spend Faith in triggering the power, so long as you get at least one success on the dice you get to add the number of Faith points you spent to the successes total for the purpose of working out whether your Torment kicks off. This gives players a decent shot of having some semblance of self-control, at the cost of rationing their Faith a bit more (but then again Demon is a game which cries out for a brisk and active Faith economy to begin with). Author Eric Zawadzki seems to have a decent handle on the virtues of both games, as well as how they’re played in the wild; for instance, in the discussion of converting Fallen‘s Apocalyptic Forms to the Descent system, he specifically assumes that the system for personalising one’s Apocalyptic Form provided in the Demon Player’s Guide are in use, and that system was so fun and such an improvement over the sometimes uninspiring off-the-shelf Forms in the core book that I suspect anyone with access to that book would be using that system. The two Demon games have extremely different aesthetic takes on the topic. Whilst there are themes of espionage in common (which the book has some quite interesting ideas on teasing out), Fallen went very much for “Judeo-Christian demons emerge from Hell only to discover that God and the Angels have gone and aren’t coming back, and must deal with that”, whereas Descent went for “It’s The Matrix at its most Gnostic.” That filtered through all the powers. Providing a way to utilise the more classically demonic powers of Fallen in Descent‘s system means that Chronicles of Darkness users get to have their own equivalent of Demon: the Fallen on an aesthetic level, which is something I think Descent didn’t deliver. Sure, the two Vampires and Werewolfs and Mages have different takes on the same stuff, but the vampires are still vampire-y in both, the werewoofles are still woofly, and the mages are still wizardy (if anything, they’re even more wizardy in the Chronicles version). Demons in The Descent just don’t feel very demonic, and whilst that game offers an interesting cosmological concept it doesn’t quite scratch the itch for playing “yeah, we’re Satanic fallen angels out to corrupt people’s souls”.